Asana practice and breath control/pranayama can greatly improve our overall well being by improving the strength, flexibility and mobility of the muscles used for respiration. We generally are using our diaphragm 70% and our intercostals 30% when we breathe. Through regular pranayama practice; the breath will have greater quality and the number of breaths will reduce as the quality improves. The yogi develops a greater awareness of the breath and the breath will become an anchor holding you steady in your everyday lives. Deepening the inhalation and strengthening the diaphragm results in the diaphragm contracting more fully, pressing onto the digestive organs and causing the belly to expand. On exhalation the diaphragm is releasing, forming a dome back up inside your rib cage and pushing the air out of your lungs. Strengthening the diaphragm and deepening the breath will reduce anxiety caused by shallow breathing. The superior vena cava is stimulated greatly with diaphragmatic breathing, returning venus blood back to the heart. Hiatus hernias are also prevented when the diaphragm is strengthened. Inhale into your belly and then into your chest feeling the belly expanding, the upper back arching and the collar bones widening. Exhale with awareness on your root/maladhara chakra – feel the pelvic floor contracting. Exhale fully and deeply. Count the breath, trying to encourage the inhale to be the same length as the exhale. Imagine the breath as waves in the ocean, inhale the wave come in – exhale the wave recede. A constant and rhythmic flow. If you are feeling anxious then extending the exhale breath in relation to the inhale will prove calming and therapeutic. Try exhaling for a count of 6 and inhaling for a count of 4. If you are feeling depressed or lacking energy and vitality then extending the inhale breath in relation to the exhale will increase your energy levels. Try inhaling for a count of 6 and exhaling for a count of 4. 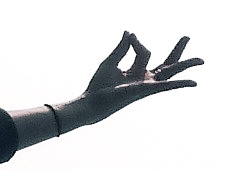 Focus on the breath and take gyan/chin mudra – the gesture of knowledge. Connecting your thumb tip with forefinger tip whenever you feel the need for grounding in your everyday life. Hoping to see you soon and if you have anything you specifically want to focus on in class or have a question relating to therapy or 1 to 1 or anything yoga, please let me know.